Your Thanksgiving table is planned. Dishes are chosen, food is organized, linens are prepared. What will add the crowning touch to this holiday feast? A centrepiece on the table! Here are some ideas to help you think through choosing your centrepiece. First, do you prefer a round arrangement, or one that is more oblong (oval, tapered)? Tall, raised above the table, or low and long? One large arrangement or a series of three small ones? Second, do you visualize rich, fall colours? Monochromatic – all white, shades of yellow? With candles or without? Here are some guidelines for the size and price, depending on the number of people at the table (if it’s a sit-down dinner). A small arrangement for a table of six people should be priced between $65 and $85. 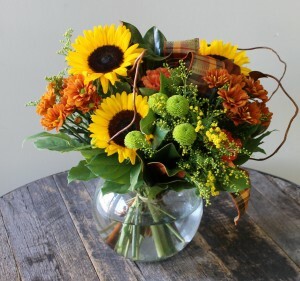 A medium size arrangement for a table of seven to ten should range from $85 to $125. And a large, elegant arrangement for a table of ten or more should be $125 to $175. This is called Autumn Sunshine. We love the bright, warm tones that evoke a sunny fall day. It is priced at $60, at the small end of the scale. It measures 13″ wide by 12″ high. This is Bountiful Blooms. It’s more substantial than the Autumn Sunshine. Arranged in a large rosebowl, it has sunflowers, green button spray mums, bronze mini daisy mums, yellow solidago and accents of curly willow, magnolia greens and an autumn ribbon. This is quite lovely, and priced at $85. The size is 17″ x 17″. Let us introduce Nature’s Harvest. This is a large round centrepiece. 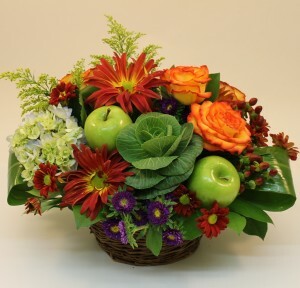 It has High and Magic roses, kale, hydrangea, hypericum berries, asters, solidago and even apples – a real harvest theme! 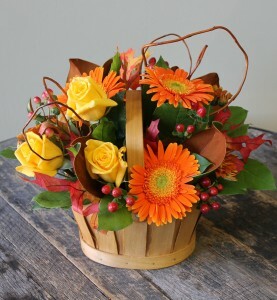 Overall, this arrangement is 13″ wide and 12″ tall, and it’s priced at $135. Nothing adds a sense of festivity to a table like a suitable centrepiece. We hope this will help you in selecting the perfect one.